Bright yellow with extremely heavy substance and heavy ruffles, green throat. Ivory infused pink polychrome above green throat. Light melon with a green heart and applique throat surrounded by a lavender beige pattern eye. Ivory cream with gold edge above green throat. 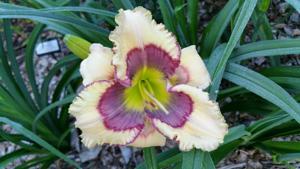 Ball shaped apricot cream blend with black anthers above yellow to green throat. 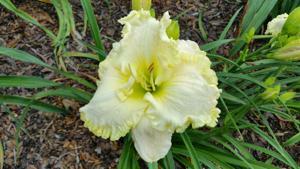 Beautiful cream white with a lacy golden yellow edge. Fragrant, 24 buds, 4 branches, Ruffled coral pink with lighter midribs and wire gold edge over yellow to olive green throat. 35 buds, 4 branches, Double 98%, Orange with red eye and edge above green throat. Purple base with a blue purple eye and matching edge, yellow green throat. Fragrant, 26 buds, 5 branches, Creamy white with a very blue eye and intense green throat. 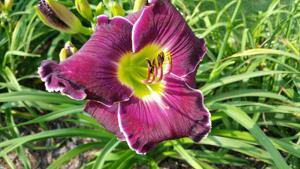 Fragrant, 40 buds, 6 branches, Royal purple base, dark blue purple eye, double edge of blue and white with green throat. Fragrant, 26 buds, 4 branches, Cream with lavender blue eye and edge above green throat. 55 buds, 7 branches, Deep purple with gold green edge, green throat. 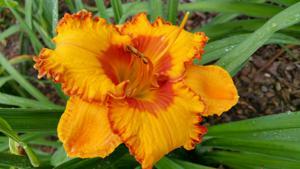 36 buds, 5 branches, Pink soft orange blend with flamboyant golden yellow edge. 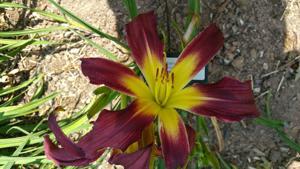 Very nice northern hardy yellow double w/red eye, was hybridized in Ohio. Unusual Form Crispate, Yellow with green throat. 26 buds, 3 branches, Dark pink with red eye and edge above green throat. Double, Dark red and cream blend with chartreuse throat. 35 buds, 5 branches, Multicolor eye etched in raspberry, fine double edging of raspberry and blue above green eye. 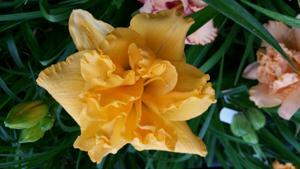 Fragrant, 15 buds, 4 branches, Double 100%, Light apricot yellow blend with plum eye above gold green throat. 30 buds, 4 branches, Royal purple with lighter purple halo, white picotee, green throat. Pink with chartreuse edge above green throat. Very Fragrant, 22 buds, 5 branches, Double 99%, Cheddar cheese orange. Yellow, gold, orange blend, darker orange outer edge, thin pencil orange eye, green throat, edged with layers of tentacles, hooks and teeth. 32 buds, 5 branches, Unusual Form Crispate-Cascade, Pink with red eye above green throat. 24 buds, 4 branches, Velvet red self with a wire gold edge. Rose lavender with darker eye above green throat. Double 95%, Cream and ivory infused with pale pink. Fragrant, 26 buds, 5 branches, Unusual Form Crispate-Cascade, Maroon purple with patterned eyezone of oranges, browns, and a green throat. 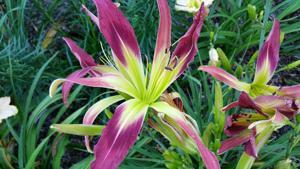 25 buds, 5 branches, Double 100%, Purple with darker purple eye and edge above yellow green throat. 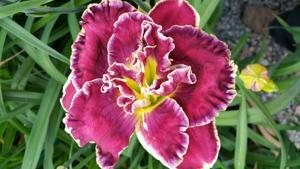 Fragrant, 20 buds, 3 branches, Double 95%, Apple red with heavily ruffled edge tipped in cream. 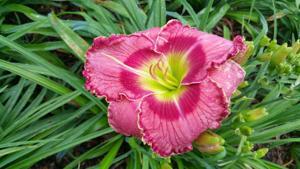 Special tetraploid double with ruffled petaloids. The color combination of this one is quite distinctive with a beautiful rose which radiates outward from the midribs with all edges throughout the blossom becoming a pastel rose. 22 buds, five way branching. Very Fragrant, 50 buds, 7 branches, Double 100%, Deep rose pink blend with pink watermark. NOT RECOMMENDED FOR NORTHERN GARDENS. Very Fragrant, 20 buds, 3 branches, Double 99%, Solid chartreuse yellow green hose in hose double. 31", 10" bloom, fragrant, 22 buds, 4 branches, Spider Ratio 4.00:1, Unusual Form Cascade, Double 99%, Red with darker red eye and a very green throat. 30" 6" Tet Ere, Bright and beautiful, true lemon yellow, (RHS color chart 13A) petaloid formed double with pastel medium rose-coral halo above a yellow to green throat, Sepals turn down. 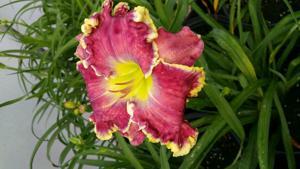 Petaloids are crested and ruffled. Smooth, diamond dusted texture. Sunfast color and substance, 4 way branching. A fabulous parent, fertile both ways. 24 in. 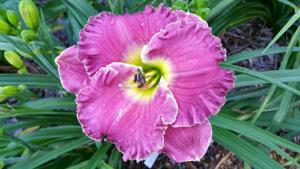 (61 cm), bloom 4.75 in. 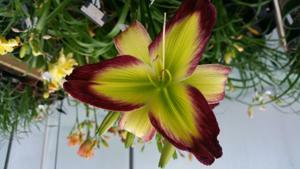 (12 cm), season E, Rebloom, Evergreen, Tetraploid, 15 buds, 3 branches, Cream with multicolored eye above green throat. 27 in. (69 cm), bloom 6 in. 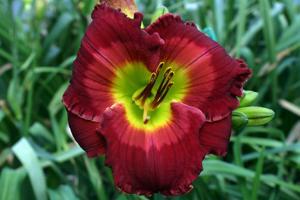 (15 cm), season M, Rebloom, Evergreen, Tetraploid, Fragrant, 16 buds, 2 branches, Rich red with slightly darker halo and ruffles. This site has been accessed 154272 times.